Leave your cares behind and enter a peaceful sanctuary looking out to the sea. The Spa, advocates of holistic, healthy and sustainable lifestyle ensures that you step out from our signature spa sessions feeling restored and revitalised. Contact our spa team for more information or booking. Tailor your wellness journey with selections of signature spa sessions focusing on a renewed self after the session, body and skin care programs for a youthful and glowing self, or the Asian touch selection of Balinese or Ayurvedic for inner peace. Partnered with Comfort Zone, the distinctive range of body and skin care treatments are tailored to each guest and utilise natural-origin, paraben-free products. Established in Parma, Italy in 1996, Comfort Zone is one of the world’s most renowned brands for holistic products, using its range of eco-friendly and paraben free oils, creams and balms for all treatments. The brand promotes a soulful and healthy lifestyle and uses the finest natural-origin ingredients combined with science-based solutions to visibly improve skin, body and mind. 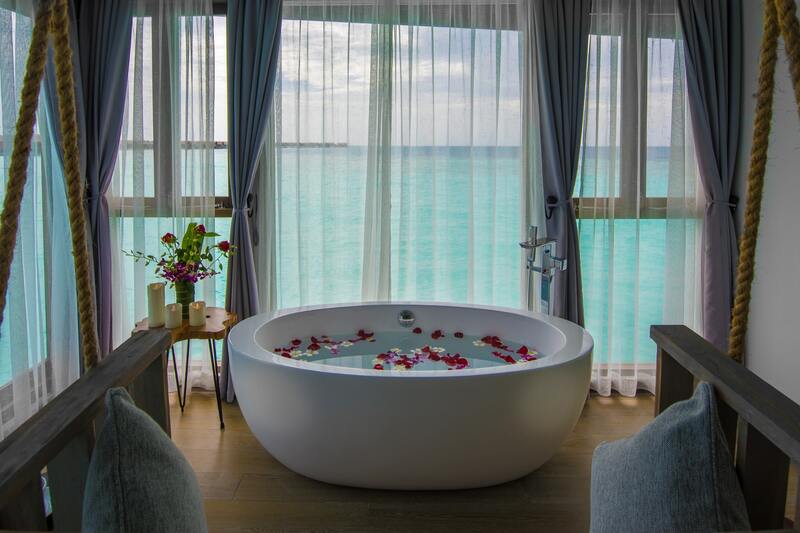 The Spa features 7 over-water treatment rooms overlooking the crystal clear water of the lagoon. The Spa offers traditional salon services including a classic manicure and pedicure, hair-cuts and styling as well as threading, ideal for guests celebrating their wedding or special occasions at the resort. A tranquil space to end your wellness journey with a cup of signature tea and healthy bites. An innovative massage acting on three different sensorial pathways for profound relaxation, favouring sleep and helping to recover jetlag side-effects. The synergy of a unique blend of essential oils, the bespoke Tranquility™ Sound, Ayurvedic and Indonesian Sea Malay techniques combined with the use of soft brushes, gently guide the way to achieving a quiet and peaceful mind and body state. A restorative journey specifically designed to perfect the skin, increase elasticity and moisture and relax the senses. Recommended for a gentle, calming day of care and attention. The spa journey includes body massage to get you in the mood for true relaxation, followed by revitalising body wrap and an organic facial treatment and end with a relaxing bath soak. After the session, embark towards a relaxing session of yoga, be it the Hatha yoga or simple a sunset yoga, perfect to calm the mind and soul for city dwellers. The Spa offers a holistic wellness retreat program to recover, rejuvenate, and reactivate your senses with a mix of activities, spa treatments, and balanced cuisine to nourish the body.